Sheamus will defend the United States Championship three weeks from Sunday at Night of Champions. Seth Rollins costs Dean Ambrose a shot at the WWE World Heavyweight Title, Roman Reigns thwarts an attack by 3MB, Cesaro steals a win over Sheamus, Erick Rowan evens the score against The Usos, and an all-out brawl breaks out between Summer Rae and Layla. Seth Rollins shockingly betrays Dean Ambrose & Roman Reigns in favor of Triple H & Randy Orton, Batista quits WWE over empty promises, Stephanie McMahon makes a huge announcement regarding Money-in-the-Bank, and John Cena narrowly avoids destruction at the hands of Kane. The Shield overcomes Evolution to beat the veterans in a clean sweep, John Cena silences Bray Wyatt's message as the last man standing, Daniel Bryan & Brie Bella humiliate Stephanie McMahon, and Sheamus, Cesaro, & Paige all retain their titles. Tonight at Payback, The Shield will face Evolution in a No Holds Barred Elimination Match, John Cena vs. Bray Wyatt in a Last Man Standing Match, and Daniel Bryan will have to choose between his wife and the WWE World Heavyweight Title. Plus, three championships will be decided. With some help from Luke Harper & Erick Rowan, Bray Wyatt defeats Jimmy Uso in a Last Man Standing Match, The Shield vows to eliminate Evolution at Payback, the United States Champion defeats the Intercontinental Champion, and Alicia Fox enrages Paige. With the aid of a sledgehammer, Evolution lays waste to The Shield, The Wyatt Family targets Jerry Lawler in an attempt to get to John Cena, the career of Brie Bella is placed in Daniel Bryan's hands, and Big E gets the better of Rusev. 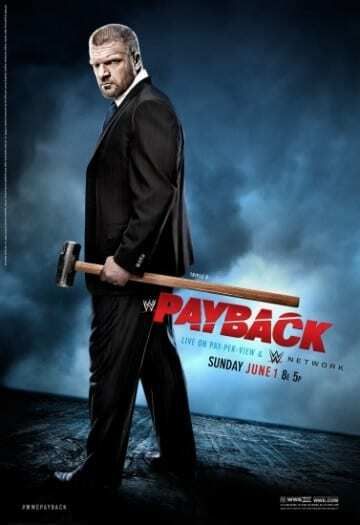 Sheamus will defend the United States Title next Sunday at Payback. Bray Wyatt backs down from a fight with John Cena, Bo Dallas makes a successful debut, Cesaro assaults Sheamus, and one mistake by Dolph Ziggler costs him in a match against Batista. Bray Wyatt proves that he has what it takes to be the last man standing, The Shield outsmarts Evolution again, Rob Van Dam beats the clock to become the new #1 Contender for the Intercontinental Title, and Stephanie McMahon orders Daniel Bryan to be at RAW next week. In the featured attraction of Main Event, United States Champion Sheamus went one-on-one with Cesaro. Plus, Emma vs. Alicia Fox and Dolph Ziggler faces Damien Sandow.